Eat your heart out Thomas Kinkade. If Garbage Lights Up, It's Art. A smart man once beautifully sang.........."You've got to know when to hold them, know when to fold them, know when to walk away......know when to RUN!!!!!" That man was my friend Mike. I haven't seen him in years. (Unless you count Facebook....which I don't, Buddy! So come over soon! ) EVERY time I sing or mentally "hear" that song I actually just hear him. Poor Kenny Rogers.....And Mike makes better chicken, too. He gives you little ramekins of honey mustard AND bbq sauce. But either way they both have good points. Knowing your limitations is an important part of life. Now I'm not saying don't TRY to do something. You should always try. But you should also recognize when something is pushing your mental sanity SO FAR in the wrong direction you start talking to......excuse me........genuinely cursing out inanimate objects. Now you know me. I love lights in the house. And having them up in my kitchen fro the past 2 1/2 months has been awesome. Don't judge me. They were next to the Halloween stuff I was putting away. What was I going to do? Make another trip to the basement a month later? Seemed silly. So I put them up. And I smile when I plug them in every morning while I make my coffee. It's a kinder, gentler way to greet the day at 4am. I know. It's sick. But my body loves to be awake at that time. It wakes up my brain and then we play......"What do I need to do today?" until eventually I 'm completely awake and just get up..........or "fold 'em"...if you will. But this project........THIS FREAKING PROJECT......is one that you should "know when to RUN" from. I do this for you people. Pinterest, man. I don't know why I think it's going to have successful crafting ideas. electricity- You should actually definitely buy this. It's the only way video games will work. You should also know that Edison is an idea stealing jerk! Team Tesla, baby! Woo!.......See you might need to Google that to get it, but I just earned so much "street cred" with Player 2. And by street, I mean lab. I'll get "lab cred"
a large piece of stretched canvas- You know. On TV when artists paint....it's the thing they put the paint on. Go cheap here as we are going to RUIN it. 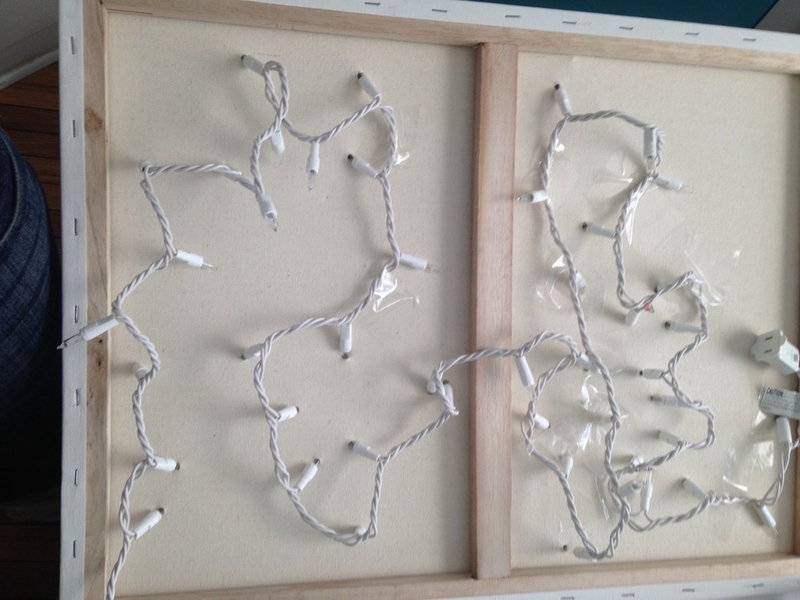 a small strand of white lights- For the love of Tesla, make SURE it's a small strand. Actually...don't. You're not supposed to be buying ANY of this! clear tape- HA. Yeah. That'll "hold 'em". Real well. All nice and neat. Won't keep popping out or anything. Stupid tape. a pointy knife- Best part of this project. Stabbing it. a small handful of dried beans- Do NOT purchase them off of a stranger. Tipsy Cones LLC holds no responsibility for the errant tossing of dried beans, magical or otherwise, that have been purchased, given to, or donated by an unknown person(s). In the event of any such act, Tipsy Cones LLC shall not be responsible for any damages or losses incurred by giant(s) and or geese. gloves- But that was when I cared. Why bother keeping it so pristine when you are just going to DRIVE YOUR FIST THROUGH IT. SIGH. Yeah. I guess lay the canvas face down on a clean surface. Now.....go with me here......grab a handful of beans and toss them at the back of the canvas....gently! We are no where NEAR angry.......yet. Why did you just do this? Because now you have a completely natural and organic pattern to use for your project. If I sat here and tried to decide where I wanted the lights to go it would have taken forever. Let's let Lady Luck lead this lighted lamination. C'mon!!!! That was alliteration annihilation! Grab a pencil and mark where each bean landed. I was actually really proud of the way that worked out. From here on out, different story. 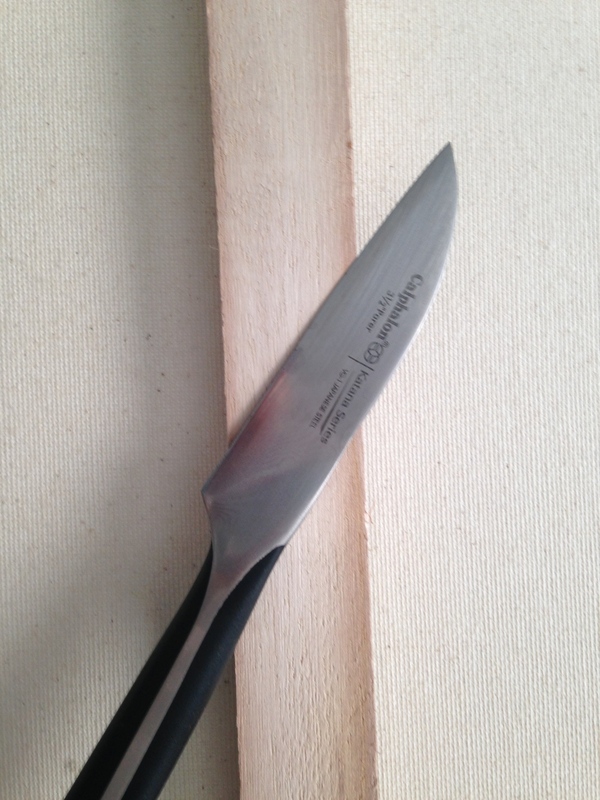 Take your pointy knife and start a tiny hole for each spot that was marked. Get ready. It's about to be SO fun. Starting with the end of the plug that stares at you like this (I I) , pop the bulbs gently through your pre-poked holes. I guess you could try really hard to make sure that all the lights follow each other neatly so you don't have too may extra lights that don't reach holes. Doesn't matter though. They pop out. You could try to use clear tape to secure them in place. But it doesn't really matter because they pop out. And on the extremely off chance they all do stay in place and you finally go to hang it up, make sure to laugh as you realize the plug part that you started this whole nightmare with............you remember....this guy (I I) .....is just a little too big to let it lay flat. Isn't that funny?!!! By like, 1/8 of an inch.....TOO FUNNY. WHATEVER. Let's just finish this thing. Find a nice table or shelf to lean it on. Plug it into the outlet and flip the switch! You can see right the freak through it. DAMN IT. You can see the stupid wood frame behind it, man! What the heck?! Watch as all of the lights pop out any way, That's about right. So this mega fail was one of those...."should have been wood and glue" crafts........Now we know.....I still want something with lights, though. Maybe I'll buy a lemon tree and string it with lights. In a completely unrelated subject.....is it just me or do you want to punch Auto Correct directly in the mouth? It changes EVERYTHING I write. Even when they are real words. It's beyond frustrating. Actually......now that we are on the subject....how come my Siri is such bi-otch? She refuses to learn "Merritt Parkway", she's rude, and quite honestly I think she's messing with me half the time. Cmmmmmmmm . ^^^^^^See??? Now THAT right there! ^^^^^ I'm just going too leave that. That's what auto correct thought I meant to write when I typed "Hmmmmm". Why is that better??? Geez. I think I need to make my next recipe...."All my electronics are out to get me" related. But with that level of paranoia we may have to eat it in a tinfoil hat. OH the tequila spritzah can't come fast enough today. And yes.......it did just try to make me write spritzer. 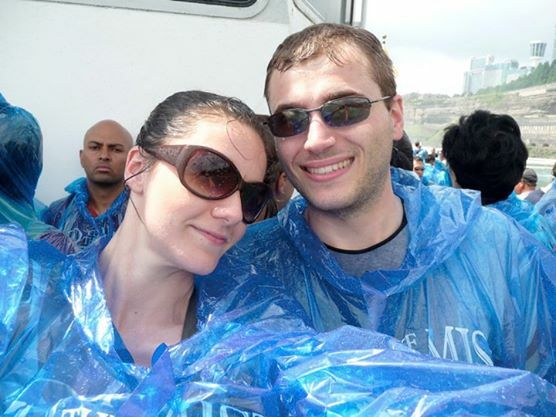 Our trip to Niagra........featuring Player 2 standing with statue of the King of Electricity....Nikolas Tesla and the both of us standing in front of the world's angriest "Maid Of The Mist" passenger. Seriously. Looks like he just tried this craft.